The Westchester County Department of Public Safety was created on July 1, 1979, through a merger of the Westchester County Sheriff’s Department and the Westchester County Parkway Police. They are committed to increasing the safety and security of all those who live, work and recreate in Westchester County. Single page notices circulated to Department of Public Safety personnel via e-mail on anniversary of deaths of 17 Public Safety (mostly County Parkway Police) officers who died while on active duty (most in the line of duty). Notices can include the officer's name, date of incident, incident details, and biographical details on officer, although the extent of the details varies. Some of the folders include photographs of the officers. The dates of the incidents run from 1792 (the nation's first law officer killed in the line of duty) to 1925-1985. Book in which Westchester County Sheriff Darius Lyon pasted receipts for payments made for supplies and for bail and other law enforcement expenses, some of which were made after his term had ended. Sheriff Lyon was elected by the public to serve as County Sheriff from 1865-1868. 1 v. Arranged by court term. Book recording service of documents by sheriff and his deputies. Volume is divided into three separate sections, including one specifically designated as for the Court of Oyer and Terminer. First section was for several courts, including Westchester Supreme Court, County Court, and Surrogates Court. 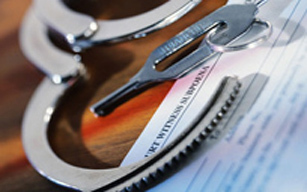 Information recorded includes names of defendants, plaintiffs, attorneys, and who made the service, whether the defendant was served or not found, date of service and fees collected.